In fact, the emission scenarios associated with the Paris goal show that warming will “overshoot” the 1.5°C target by up to half a degree, before cooling back to it by the end of this century. Those scenarios rely unduly on unproven Bio-Energy with Carbon Capture and Storage (BECCS) technology in the second half of the century, because the Paris Agreement does not encompass the steep emissions reductions that are required right now. Average global warming is now 1.1°C above the late nineteenth century, and the rate of warming is likely to accelerate due to record levels of greenhouse gas emissions, a higher climate sensitivity and because efforts to clean up some of the world’s dirtiest power plants is reducing the emission of aerosols (mainly sulphates) which have a very short-term cooling impact. HENLEY and KING: In 2017, Melbourne researchers Ben Henley and Andrew King published Trajectories toward the 1.5°C Paris target: Modulation by the Interdecadal Pacific Oscillation on the impact of the Interdecadal Pacific Oscillation (IPO) on future warming. The IPO is characterized by sea surface temperature fluctuations and sea level pressure changes in the north and south Pacific Ocean that occur on a 15-30 year cycle. In the IPO’s positive phase, surface temperatures are warmer due to the transfer of ocean heat to the atmosphere. The IPO has been in a negative phase since 1999 but recent predictions suggest that it is now moving to a positive phase. The authors found that “in the absence of external cooling influences, such as volcanic eruptions, the midpoint of the spread of temperature projections exceeds the 1.5°C target before 2029, based on temperatures relative to 1850–1900”. In more detail,”a transition to the positive phase of the IPO would lead to a projected exceedance of the target centered around 2026”, and “if the Pacific Ocean remains in its negative decadal phase, the target will be reached around 5 years later, in 2031”. KONG AND WANG: In a study of projected permafrost change, Responses and changes in the permafrost and snow water equivalent in the Northern Hemisphere under a scenario of 1.5 °C warming, researchers Ying Kong and Cheng-Hai Wang use a multi-model ensemble mean from 17 global climate models, with results showing that the threshold of 1.5°C warming will be reached in 2027, 2026, and 2023 under RCP2.6, RCP4.5, RCP8.5, respectively. On the present, high-emissions RCP8.5 path, the estimated permafrost area will be reduced by 25.55% or 4.15 million square kilometres at 1.5°C of warming. XU and RAMANTHAN: A recent study by Yangyang Xu and Veerabhadran Ramanathan, Well below 2 °C: Mitigation strategies for avoiding dangerous to catastrophic climate changes, looked at the high-end or “fat-tail” risks of climate change, in an analysis of the existential risks in a warming world. One of two baseline scenarios used, named Baseline-Fast, assumed an 80% reduction in fossil fuel energy intensity by 2100 compared to 2010 energy intensity. In this scenario, the level of atmospheric carbon dioxide had reached 437 parts per million (ppm) by 2030 and the warming was 1.6°C, suggesting that the 1.5°C would be exceed around 2028. 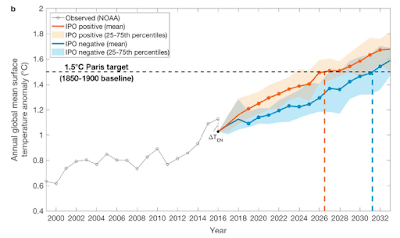 The study also found that under the Baseline-Fast scenario warming would reach 2.4°C by 2050. It is discussed in more detail here. 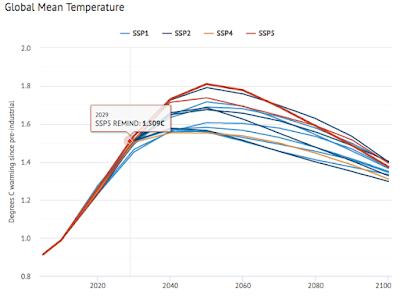 ROGELJ et al: In Scenarios towards limiting global mean temperature increase below 1.5°C, Joeri Rogelj and co-researchers plot future emissions and warming based on five distinct “Shared Socioeconomic Pathways” (SSPs). These “present five possible future worlds that differ in their population, economic growth, energy demand, equality and other factors”, according to CarbonBrief. The fourth and fifth paths are the world we now live in: SSP4 is a world of “high inequality”, whilst SSP5 is a world of “rapid economic growth” and “energy intensive lifestyles”. If we look at these paths charted against projected temperatures, then SSP5 exceeds 1.5°C in 2029 and SSP4 by 2031. SCHURER et al: In Interpretations of the Paris climate target, Andrew Schurer and colleagues demonstrate that the IPCC uses a definition of global mean surface temperature which underestimates the amount of warming over the pre-industrial level. The underestimation is around 0.3°C, and a higher figure includes the effect of calculating warming for total global coverage rather than for the coverage for which observations are available, and warming from a true pre-industrial, instead of a late-nineteenth century, baseline. If their finding were applied, warming would now be 1.3°C or more, and hitting the 1.5°C benchmark would be just half a decade away. By 1.5°C, a sea-level rise of many metres, and perhaps tens of metres will have been locked into the system in the longer term. In past climates, carbon dioxide levels of around 400 ppm (which we exceeded three years ago) have been associated with sea levels around 25 metres above the present. And six years ago, Prof. Kenneth G. Miller noted that “the natural state of the Earth with present carbon dioxide levels is one with sea levels about 20 meters higher than at present”. The expected sea-level rise this century is generally in the range of one to two metres, but higher increases cannot be ruled out. The US military, for example, use one- and two-metre sea-level-rise scenarios in their planning. Clearly, as Former NASA climate chief James Hansen and co-authors wrote last year, “the world has overshot the appropriate target for global temperature”. They noted a danger of 1.5°C and 2°C targets is that they are far above the Holocene (human civilisation) temperature range, and if such temperature levels are allowed to long exist they will spur “slow” amplifying feedbacks which have potential to run out of humanity’s control. Hence “limiting the period and magnitude of temperature excursion above the Holocene range is crucial to avoid strong stimulation of slow feedbacks”. And in all this evidence, what worries me most? It is my experience that with few exceptions neither climate policy-makers nor climate action advocates have a reasonable understanding of the imminence of 1.5°C and its consequences.